4194, lots more caught and returned. The largest fish of 8lb was caught in August. Note: Started off with some keen fishers out in April even though the trout were thin sport was good, more fish were recorded in the book by the anglers. September produced some good fish with the biggest of the season being a nice 8lb and returned, there were also a 31/2lb and 21/2lb caught in the same week. There 3 char, 1 seatrout and a salmon kelt caught and returned. Total recorded in this book 3484 many more were caught and returned several Char were caught - returned (biggest 3 1/2lb). Note: Plenty fish caught, sport was mixed due to weather conditions, plenty wind from the Southerly's and good to see a few new faces and one gentleman of 97 years young. 3184, lots more caught and returned. 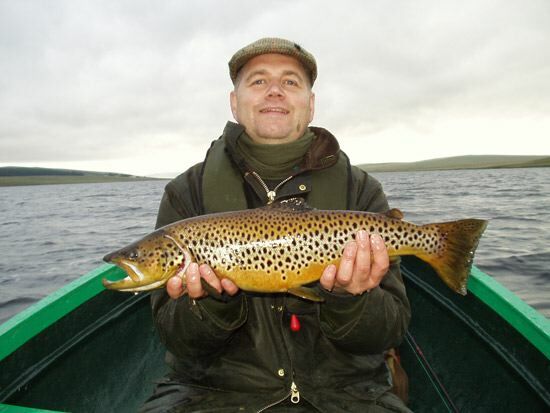 Another fish of 6lb 2oz was caught in August, the biggest trout, a hen fish was photographed, weighed and then returned. Note: A mixed season, gales of wind, heavy showers and very very cold, condition of fish was poorer than normal in the early part of the season but picked up in July/August with a few good sized trout caught. 3179 trout and recorded, numerous others caught but not recorded in book. Note: A slow start to the season, it picked up as the went on, August and the weather changed for the worse with heavy rain and strong winds for near 2 weeks and that put the water levels in the lochs way up to spring level. One Char caught about half pound in September and a huge trout lost. Note: Early seasons cold and windy through to August, then the lochs were low in water and very bright, smaller fish were then being caught. The biggest fish caught on the Badanloch system was 6lb 3oz caught by Ian Stoddart on an orange muddler. Many more fish were caught but not recorded. Note: poor season due to bad weather at the start of the season, however two large trout (6lb and 6.2lb) were caught on the lochs this season.